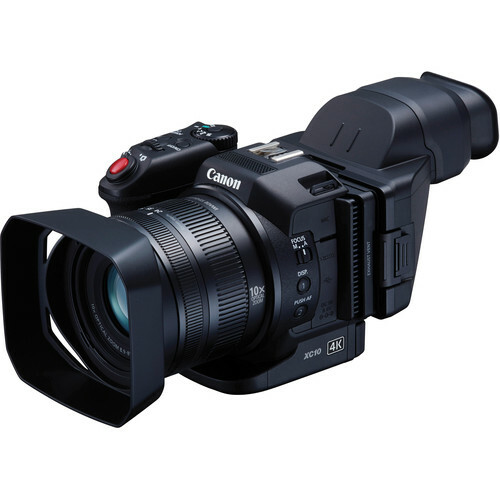 With the XC10 4K Camcorder from Canon, professional Ultra HD 4K recording capability is presented in a package ergonomically designed for handheld operation and portability. The camera incorporates a 10x f/2.8 to 5.6 SLR-style manual zoom lens with auto and manual focus capability. The 4K recording in a compact form factor is made possible by the camera's 1" CMOS sensor that is backed by a DIGIC DV 5 image processor. With a 4224 x 3164 total resolution, it can capture video at up to 3840 x 2160 and 4:3 photos in up to 12MP (4000 x 3000). The 8.9 to 89mm lens yields a 35mm equivalent focal length of 27.3 to 273mm in video mode, and 24.1 to 241mm in the 4:3 photo modes. Video is recorded with H.264 compression and packed in the widely supported MXF wrapper. Bit rates of 35 and 50 Mb/s are available for 1080i/p recording, and there are 205 and 305 Mb/s modes (depending on frame rate) for UHD 4K. The size of the XC10 lends the camera to run-and-gun applications, such as documentary and many types of event shooting, where the larger form factor of an interchangeable lens cinema camera or DSLR might prove impractical. Another use case for high performance in a small body is mounting on a medium-sized UAV such as a hexa-rotor. The camera features a hot shoe that supports Canon speed lights or works as a standard cold shoe for LEDs, microphones, or other third-party on-camera accessories. Still photos, user settings, and video up to 1080p are recorded to SDXC/SDHC memory cards. To handle the up to 305 Mb/s bit rate of 4K video there is also a CFast card slot. Compatible memory cards and card readers are available separately. Box Dimensions (LxWxH) 14.2 x 9.05 x 8.55"
XC10 4K Professional Camcorder is rated 4.7 out of 5 by 3. Rated 4 out of 5 by Michel from Nice camera. The smallest cinema camera. Its best used for film like setup since it has a lot of manual settings that take time to adjust. The zoom lens is not powered , since there is almost no zoom in film not a great handicap. The picture is very good, so is the dynamic range. The auto focus works well so does the stabilization. Lots of bang for the buck. Rated 5 out of 5 by John from Nice camera! Pleased with the capability and quality of the video and still recordings. Purchased to capture Competitive swimming. Rated 5 out of 5 by Kevin from Great Camera This is a replacement for the same camera that was stolen. My son uses this for his school work and making youtube videos. Can it be used for live streaming and if so, at 1080p and/or 4K? how long does each clip record? This camcorder will record for as long as the memory card and quality settings allow for. There is no specific time limit on a clip. I thought the xc10 came with a cfast card/ reader? Has this changed? Yes, this has changed. This XC10 does not come with a CFast reader. I would presume the Canon thinks more people than not have CFast readers by now and in the desire to keep costs down has dropped it from the current camera. whats the diferrence NTSC or PAL model? If you shoot NTSC and then try to show it on a PAL monitor, it will not play. This differentiation is based on country. Basically, if you are in North America and Japan, you can use NTSC. If you are in Europe and most of the rest of the world, you use PAL. It comes with a carrying case?? Does it have an XLR connector? Does this come with the viewfinder? Yes, the Viewfinder Loupe is included with the XC10. Yes, this camcorder has clean HDMI out.